Lady and the Blog → Health → It’s National School Breakfast Week, so Wake Up to School Breakfast! 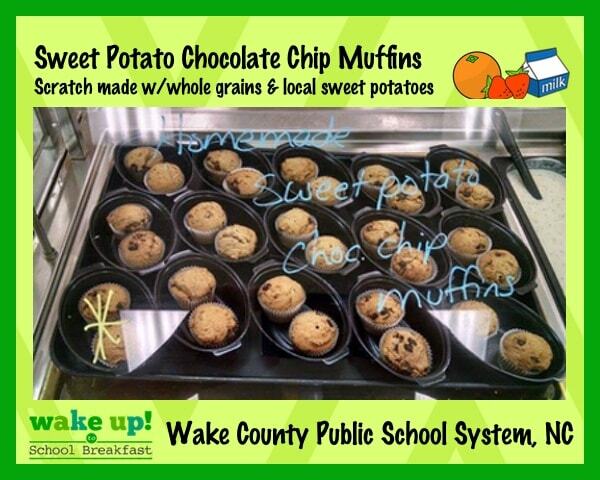 It’s National School Breakfast Week, so Wake Up to School Breakfast! Did you know that March 7th-11th is National School Breakfast Week (NSBW)??? NSBW is a week long celebration of the school breakfast program. The hopes for the week would be to not only celebrate but to drive awareness which will, hopefully, lead to increased parental awareness and student participation in the program. NSBW encourages parents to learn more about their local school nutrition program, updates to federal nutrition guidelines, and initiatives in local schools to help children make healthy choices in the morning. The facts are so clear…breakfast is the most important meal of the day and, sadly, not enough kids eat breakfast. Kids just can’t learn unless they are nourished and can’t think clearly if they are hungry. And this just can’t happen. Our schools are doing their best to nourish our kids by serving healthy and tasty breakfast and people need to know it and utilize it! When I was a kid, my mom most certainly took advantage of the NYC program…even during the summer months! Students who eat breakfast have better attention and memory. Research indicates the quality of foods children eat impacts cognition—with poor nutrition linked with absenteeism, hunger symptoms and psychosocial problems. Source: The Wellness Impact Report, 2013 (Compiled by the National Dairy Council, GENYOUth, the American School Health Association, and the American College of Sports Medicine). Students who eat school breakfast attend, on average, 1.5 more days of school per year and score 17.5% Fact higher on standardized math tests. Students who participate in school breakfast show improved attendance, behavior, standardized achievement test scores, and decreased tardiness. Because of this and so many more reasons, I’m working with the non-profit School Nutrition Association, a member association of professionals who plan and prepare meals in school cafeterias across the country (i.e. district directors, dietitians, school chefs, cafeteria managers etc), to help spread the word. Tell your family members, friends, and local media! Make sure that everyone knows how important this program is and how easy it is for kids to participate. To help give you some inspiration, please check out some amazing examples from school programs doing positive things for children’s nutrition at facebook.com/TrayTalk. Participate in week-long giveaways on the Tray Talk Facebook page by answering some questions and submitting info on their children’s favorite healthy foods or school experience. It’s easy and it’s a great cause. Kids all over the country are learning about and enjoying a balanced, healthy meal to get their day going in the best possible way. How will you get spread the word and get involved?? This is a sponsored post. Lady and the Blog LLC partners with the School Nutrition Association. All opinions are my own. Muffins are big in our house, too. These ones sound wicked good. We never get to school on time to actually eat breakfast. I am thankful that it is there just in case…. This is really cool, I had no idea it was national school breakfast week. Thanks for some information I do like that schools have breakfast readily there for kids who may not be able to or have time to eat at home! There is a National breakfast week? I am all for it! I am a cerealaholc! My son loves his bagels for breakfast and a side of yogurt! It is so important for kids to have a good breakfast before school. Our school has a great program for the kids. I used to volunteer for my kids Breakfast for Learning program. It was a great way to get kids to start the day right. I always make sure the kids have a great breakfast. It is so important to start the day right. Kids need a nutritious breakfast to start off their day! It really helps them stay focused on what’s important! I think breakfast is so important for my kids. I try to feed them wholesome choices each and everyday. These are some interesting facts! I know a lot of the children in the community where we live rely on school meals! hey i love the name of your blog. it is adorable. addition the post is great. kids need a good breakfast to start their day. i remember when i was in school if i didnt have a good breakfast i would be so sluggish. I think it’s terrific that some schools are offering breakfast now. That didn’t happen back when I was in school. I think about what my siblings and I had for breakfast as kids and it’s a wonder we ever learned to read. I try to send my kids with their bellies full of nutrients. School breakfasts are so important. Many kids get the majority of their food from school. Until poverty in this country is addressed, school meals are invaluable.